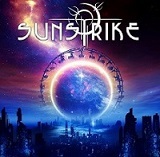 Sunstrike was formed by guitarist Joachim Nordlund and drummer Johan Lindstedt together with singer Christian Eriksson (Twilight Force, The Theander Expression) in late 2012. Joachim and Johan also are members of Swedish metal act Astral Doors. Right from the start the three guys had a very clear image of how the music should sound like: pure melodic hard rock was on the agenda! Fredrik Plahn (Prey), Mats Gesar (Thalamus) and bass player Björn Lundqvist (Twilight Force) soon completed the band. Two demo songs were posted on the band’s Facebook page in summer of 2013, and immediately the word was out about this new melodic rock outfit from Sweden. The song-writing/recording continued through 2013 in Joachim’s Big Turn Studio until they had 12 songs that were strong enough for the album ”Rock your World” which was released in 2014 on AOR Heaven. After the release of their critically acclaimed debut album, Johan Lindstedt and Joachim Nordlund soon started working on new songs for an upcoming album. They once again teamed up with Christian Eriksson, Fredrik Plahn and Mats Gesar and started the recordings of what was to become album no. 2, “Ready to Strike”, in Joachims Big Turn Studio in the fall of 2015. Bass player Bjorn didn't find the time to lay down his tracks for this album, so Joachim took care of the bass lines. To make the choirs as big and fat as possible two friends of the band, Danne Andersson and Annsofie Lindström, joined them in the studio for a couple of days and nailed down some cool harmonies. Being very pleased with Erik Mårtensson’s work with the mixing/mastering of the first album, the choice was pretty easy this time around.